For all kind of leather, suede, nubuck and fabric materials in the high-tech branch. If there's a problem, just let us know and we will fix it. The brush wheel removes dirt and dust from the shoe before polishing. Carefully crafted from the finest wool, the brush wheels apply leather polish evenly across the surface of the shoe –. This fully automatic shoe shine machine ensures your shoes are always picture perfect and ready to make a positive impression. Smooth-Finished Leather Care Kit includes Brush and Dauber Brush, Foam Leather Cleaner and Sponge, Leather Protector and Neutral Boot Cream. Type: Shoe Polish. Type: Polish/ Protectors. Fashion & Footwear > Bags & Accessories > Shoe Care Kits. 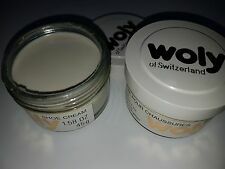 2 jars WOLY of Switzerland 1.59oz 45g. clearance prices. bye two lots get one more put in for free. 85ml bottle. Cool Boxes. Tent Electrics. Military Clothing. Trestle Tables. Sleeping Bags. Camping Toilets. Caravan Awnings. Leder-Gris® Xtreme is a mixture of 50% wax, and 50% oil and should be used as a restorative rather than for everyday use. Designed to soften leather after prolonged exposure to water has resulted in hardening and cracking where the boot flexes. It should extend the time before the leather starts to crack. The mixture of 30% oil and 70% wax penetrates deep into the leather resulting in the leather regaining its softness. Can also be used to soften heavy leathers. Size – 80grams, Weighs – 122grams, Colour – clear. Available in Brown (by Boston), Taupe (by Grison), White (by Grison), Light Beige (by Grison), Cognac (by Boston), Rich Brown (by Punch), Beige (by Punch), Cognac (by Grison), Red (by Grison), London Tan (by Grison), Neutral (by Punch), Pearl (by Grison), Yellow (by Grison), Pallisandre (by Grison), Fuschia (by Grison), Red Mahogany (by Griso n), MARINE NAVY BLUE, Dark Brown (by Grison), Violet (by Grison), Cherry Red (by Grison). Tarrago Mink Oil - 2 x 100g. Tarrago original mink oil in the great value 100g tin. For non-dark leathers, mink oil will darken leather by a shade. Also suitable for oil tanned leather. Lubricates leather. Altbergs Leder-Gris is a mixture of 70% wax and 30% oil. 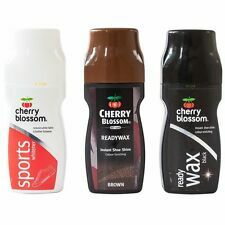 The wax waterproofs as it dries on or just below the surface of the leather. The oil penetrates deeper into the leather and helps to retain its suppleness. Size - 80 grams. Colour - Black. Size: 200ml. 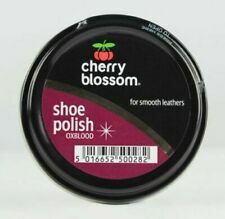 Leather Polish 200ml. Channel Islands, Isle of Wight, Isle of Man, Scilly Isles, Scottish Highlands, Scottish Islands, Northern Ireland. 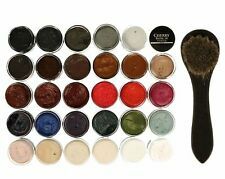 DR MARTENS NEUTRAL BOOT or SHOE POLISH - FREE UK P&P! Dr Martens Neutral Polish 1 Tin. Our polish provides effective rain and stain resistance and buffs quickly to a high shine. For use on smooth leathers. Glow in the Dark. Coloured Tip. Cheques (UK Only). Not only is cleaning military boots important for public patrols, but overall maintenance will keep your uniform looking good for longer. Altberg Leder Gris wax works on two levels, allowing wax to remain on the surface to increase the natural resistance of your army boots. The wax provides waterproofing; as it dries, it remains on or just below the surface. Provides waterproofing by remaining on or just below the surface as it dries. Directions: Apply with a brush and buff vigorously to drive the oils into the leather. 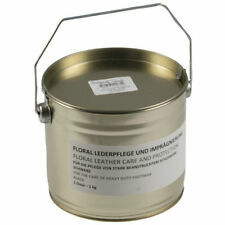 Punch Leather and Canvas Whitener - 75ml. Punch leather and canvas whitener in great value 75ml bottle. Suitable for canvas, vinyl and leather shoes - covers evenly. Not suitable for suede and nubuck. The perfect MOD Brown polish for your boots! This high quality military brown polish cleans, conditions and protects the leather and covers scuffs. Made using Carnauba Wax this polish will buff to a high shine. Specially developed for the new generation of brown combat boots. 100ml. Weighs 112 grams. Colour MOD military brown. Redback Boot Wax, Specially formulated from natural ingredients including bee's wax and oils, Regular applications of Redback boot wax will, greatly extend the lifespan of your leather boots. 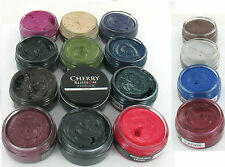 Redback Boot Wax.